The surgical correction of astigmatism is the last frontier to optimizing visual outcomes for patients. Practical Astigmatism: Planning and Analysis is a comprehensive guide to correcting astigmatism from preoperative planning to postoperative analysis. This provides readers with unique insight to what actually happened surgically: did the astigmatism over or under correct? Was it on axis or off axis? With this book, ophthalmologists will be able to analyze previous procedures with the appropriate nomograms and more often achieve targeted outcomes. 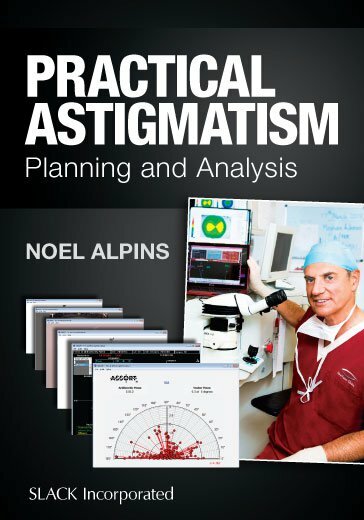 Dr. Noel Alpins has developed the Alpins Method of astigmatism to provide accurate planning and analysis of astigmatism procedures. His method focuses on analyzing refractive and corneal astigmatism parameters and using the results in future surgery to improve visual outcomes. The importance of the ocular residual astigmatism (ORA) is detailed when planning astigmatism surgery. Practical Astigmatism features vector planning for refractive laser surgery as well as planning and analysis applied to cataract and limbal relaxing incisions, in addition to demonstrating graphical analysis of astigmatism using high quality vector and fan diagrams, as used in scientific journals. In addition, hemidivisional analysis of the irregular cornea, corneal coupling in incisional and excimer laser surgery for mixed astigmatism and toric IOL planning with total corneal power using corneal topographic astigmatism (CorT total) are addressed as well. How do I diagnose each, and how does this affect my surgical technique? Can I incorporate corneal astigmatism when performing excimer laser surgery? Why are my LRIs undercorrecting the astigmatism? Is it safe to perform excimer laser on keratoconus patients? Which corneal astigmatism measure do I choose and what do I do following a refractive surprise? Practical Astigmatism: Planning and Analysis will help ophthalmologists, optometrists, and technicians alike address each patient’s unique circumstances and act as your in-depth guide to correcting astigmatism. “Noel Alpins' new volume provides an overview connecting the many contributions he has made (20 papers he has first authored in the peer reviewed literature since 1993). Few surgeons will have had direct access to all his contributions so the book fulfils a need for surgeons to be able to study his methods and reasoning behind them, of course based on his exceptional clinical experience.” - Emanuel Rosen, B.Sc, MD, FRCSE, FRCOphth. Dr. Alpins pioneered small-incision cataract surgery in Victoria, Australia, in 1987 and then became a founder and current member of the Excimer Laser & Research Group. He has specialized in cataract and refractive surgery since founding NewVision Clinics in Melbourne, Australia, in 1996. He speaks widely on surgical techniques at national and international meetings and has been a keynote speaker and chair on many occasions. Dr. Alpins serves on the Royal Australian and New Zealand College of Ophthalmologists (RANZCO) program committee, and has served as chair for the invited speakers subcommittee since 2008. In 2010, he was the invited Council Lecturer at the RANZCO annual scientific meeting in Adelaide, South Australia, which was established to honor Fellows engaged in original work. In addition to his many writings and lectures, he continues to investigate the vector analytic approach to astigmatism analysis that he pioneered (the Alpins Method). He is involved in ongoing clinical research in this area. He is also an international council member of the International Society of Refractive Surgery (ISRS) of the American Academy of Ophthalmology (AAO). Dr. Alpins is on the editorial board of a number of publications, including the Journal of Cataract & Refractive Surgery (official journal of the American Society of Cataract and Refractive Surgery and the European Society of Cataract and Refractive Surgeons), the Journal of Refractive Surgery (a publication of the International Society of Refractive Surgery affiliated with the American Academy of Ophthalmology), Ocular Surgery News, EuroTimes, and others. He has contributed over 150 articles in peer-reviewed journals and ophthalmic periodicals as well as more than 20 book chapters. In 2015, he received the Certificate for Outstanding Contribution in Reviewing, awarded by Elsevier. Dr. Alpins received the 2012 ISRS/AAO Lans Distinguished Award in Chicago, and in 2014 he received the ISRS Lifetime Achievement Award. Dr. Alpins is on the international advisory board for refractive surgery in China. In January 2017, Dr. Alpins was awarded Member in the General Division of the Order of Australia for “significant service to ophthalmology, particularly to the development of innovative refractive surgery techniques, and to professional associations.” The Order of Australia was established in 1975 by letters patent of Elizabeth II, Queen of Australia, and countersigned by Prime Minister Gough Whitlam. Around 500 prominent Australians receive the award annually. Dr. Alpins is also regularly appointed as an ambassador for the state of Victoria in the government’s annual Australia Day. Dr. Alpins is the 2017 RANZCO “Norman McAlister Gregg Lecturer” for 2017. The Gregg Lecture was established in 1958 by the Council of the Ophthalmological Society of Australia in recognition of the outstanding contribution made to ophthalmology by Sir Norman Gregg. Dr. Alpins and his wife, Sylvia, have three daughters: Fiona, Vanessa, and Martine. When Dr. Alpins is not practicing ophthalmology, he enjoys playing golf, skiing, going to live entertainment, and spending time with Sylvia, his daughters, and grandchildren. Fellowships and certifications: Ophthalmology Registrar, Royal Victoria Eye & Ear Hospital, Australia, 1974-77; Fellow, RANZCO, 1978; Fellow, Royal Australasian College of Surgeons, 1978; Fellow, American College of Surgeons, 1985; Fellow, Royal College of Ophthalmologists (UK), 1989; Fellow, American Board of Eye Surgery, 2005; Honorary Senior Lecturer, Melbourne University Department of Ophthalmology, 2013. Memberships: International Intra-Ocular Implant Club; American Society of Cataract and Refractive Surgery; European Society of Cataract and Refractive Surgeons; International Society of Refractive Surgery; American Academy of Ophthalmology; and the Australian Medical Association.